Background: Childhood cancer is the second most common cause of death in children in the United States. Treatments for childhood cancers usually incorporate chemotherapy, radiation therapy, immunotherapy, and/or surgery. This review of contemporary literature highlights the necessity for interprofessional care to achieve the best dental outcomes for this patient population during cancer treatment, as well as for children who are long-term cancer survivors. Methods: A literature search at PubMed identified research and review articles about oral and dental complications in children diagnosed with cancer. Also included were evidence and current best practices from guidelines published by the American Academy of Pediatric Dentistry on dental management of pediatric patients receiving chemotherapy, hematopoietic cell transplantation, and/or radiation therapy. Finally, clinical recommendations from the European Society for Medical Oncology Guidelines Working Group on management of oral and gastrointestinal mucositis were included. The literature search was limited to articles published in the English language. Results: Children with a new diagnosis of cancer should have dental care provided by a pediatric dentist to mitigate the oral complications from cancer treatment as well as to avoid dental infections during immunosuppressed states. An individualized oral care program can be developed for each patient to manage and treat acute and long-term oral complications related to cancer treatment. Conclusion: Childhood cancer survivors present with unique challenges for dental management because of dental anomalies caused by cancer therapy. Interprofessional collaborative care between the pediatric dentist and the oncologist during and after cancer therapy will enable best outcomes for the pediatric patient. In addition, dental professionals must be prepared to meet the unique needs of long-term cancer survivors because of the increasing survival rates of childhood cancers. Assessment of the oral cavity and management of dental complications is important for all children but particularly for children with cancer. Dental and oral care–related problems arise in these children at various phases of cancer treatment and after completion of cancer treatment. From a dental perspective, the pediatric patient undergoing oncology treatment may (1) have preexisting untreated dental caries, periodontal disease, and/or pathologic lesions of the oral hard and soft tissues; (2) have oral manifestations of the cancer; (3) develop oral complications as a result of cancer therapies; and (4) develop long-term dental and orofacial complications after completion of cancer therapies. As a first step in developing this review of the topic, a literature search at PubMed identified research and review articles about oral and dental complications in children diagnosed with cancer. Also included were evidence and current best practices from guidelines published by the American Academy of Pediatric Dentistry on dental management of pediatric patients receiving chemotherapy, HCT, and/or radiation therapy. Finally, clinical recommendations from the European Society for Medical Oncology Guidelines Working Group on management of oral and gastrointestinal mucositis were included. The literature search was limited to articles published in the English language. Figure 1. 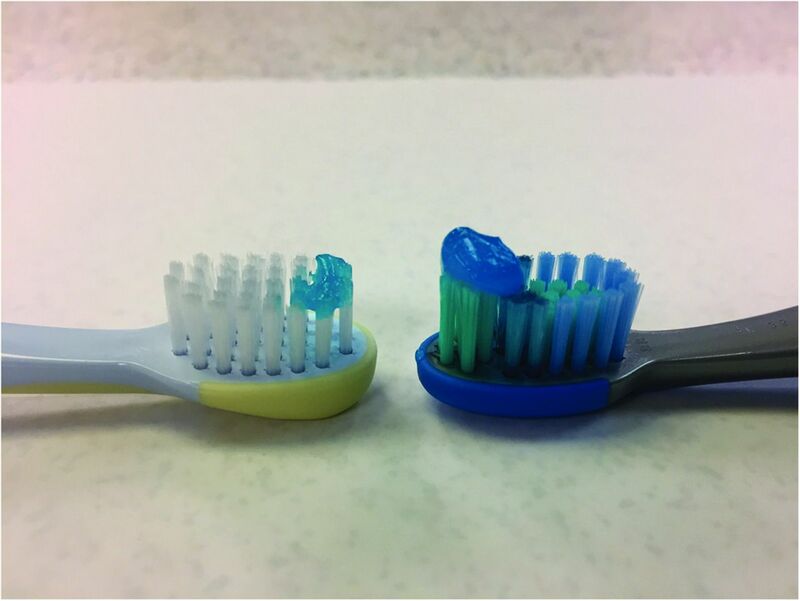 A smear of fluoridated toothpaste (left) is recommended for children younger than 3 years, whereas a pea-size amount of toothpaste (right) is recommended for children 3-6 years. Dietary counseling should include identification of noncariogenic foods that do not contain fermentable carbohydrates.12 Consumption of sweetened beverages such as juices and sodas should be limited.12 Given the emotional circumstances of having a child with cancer, parents may be tempted to provide the child with comfort foods that are rich in sugar or carbohydrates. However, the parents and child need to be counseled on the importance of diet in preventing dental caries and minimizing complications during cancer treatment. The pediatric dentist has to make decisions about the details of dental treatment, such as the choice of restorative materials and treatment techniques, knowing that the child is likely to be immunosuppressed in the near future. Ideally, all the dental treatment should be completed prior to commencement of cancer treatment.3,17,18 If this timing is not feasible because of urgency to begin therapy, the dentist is likely to prioritize the treatment of dental infections, extractions, periodontal therapy, and elimination of sources of intraoral tissue irritation. Opinions differ among pediatric dentists regarding the use of therapeutic pulpotomy to treat vital primary teeth with reversible pulpitis.3,18,19 In the absence of evidence-based recommendations for vital pulp therapy in immunocompromised children, pediatric dentists tend to favor providing definitive treatment in the form of extraction of the primary tooth to avoid complications in the upcoming immunosuppressed state.18 If previously treated primary teeth are clinically and radiographically sound, extraction is not indicated.3,18 Root canal treatment should be performed for permanent teeth when indicated, provided they are restorable.3,18 Ideally, root canal treatment for permanent teeth should be completed at least 1 week prior to initiation of cancer treatment to ensure healing of the periapical periodontal tissue. If this timing is not feasible, extraction should be considered. The mainstay of management of oral mucositis is palliative care.3,25 Maintaining good oral hygiene is important to prevent as well as to reduce the severity of oral mucositis.30,31 Softening toothbrush bristles in warm water for a few minutes may be necessary to facilitate comfort during brushing. Patients who have severe mucositis and cannot tolerate a toothbrush can use foam brushes.3 Oral cryotherapy, recombinant human keratinocyte growth factor-1, low-level laser therapy, sodium bicarbonate rinses, and benzydamine mouthwash have evidence-based support for management of oral mucositis in patients with cancer.25 Analgesic medications can be used to treat pain associated with oral mucositis.3,25 Topical anesthetics obtund pain for a short duration but do not treat the mucositis.3,25 Further, because of systemic absorption from the oral mucosa, topical anesthetics can have cardiovascular and central nervous system effects and therefore should be used judiciously in young children, if at all. Children who receive plant alkaloid chemotherapeutic agents such as vincristine and vinblastine may develop neuropathic pain that usually affects mandibular teeth. These children complain of deep pain in the jaw and teeth in the absence of an odontogenic source of pain.3,18,23 Such neuropathic pain is usually transient in children and diminishes or resolves after completion of chemotherapy.3 In the absence of a definitive cure for chemotherapy-induced neuropathic pain, palliative care may be provided with over-the-counter pain medications. Children being treated with HCT receive all the chemotherapy and/or total body irradiation just a few days before the transplant.18 They have a prolonged immunosuppressed phase,18 and elective dental treatment cannot be performed during this immunosuppressed period. Immunologic recovery usually occurs at least 100 days after HCT; recovery time may be longer if graft-vs-host disease (GVHD) or other complications develop. Therefore, completing dental treatment prior to the initiation of HCT is critical. In these children receiving HCT, mucositis develops 7-10 days after initiation of conditioning and lasts up to 2 weeks after the end of conditioning. The intensity and severity of oral complications begin to decline 3-4 weeks after completion of transplantation. This period corresponds to phase III (engraftment to hematopoietic recovery), and the primary oral concerns during this phase are acute GVHD, xerostomia, hemorrhage, neurotoxicity, temporomandibular dysfunction, and exophytic oral lesions (eg, granulomas, papillomas). Phase IV (immune reconstitution) begins approximately 100 days post-HCT. The oral concerns during this phase are related to the chronic effects of the conditioning regimen and include xerostomia, craniofacial growth abnormalities, viral infections, chronic GVHD, and predisposition to oral squamous cell carcinoma. Dental professionals must be prepared to meet the unique needs of long-term cancer survivors because of the increasing survival rates of those with childhood cancers. 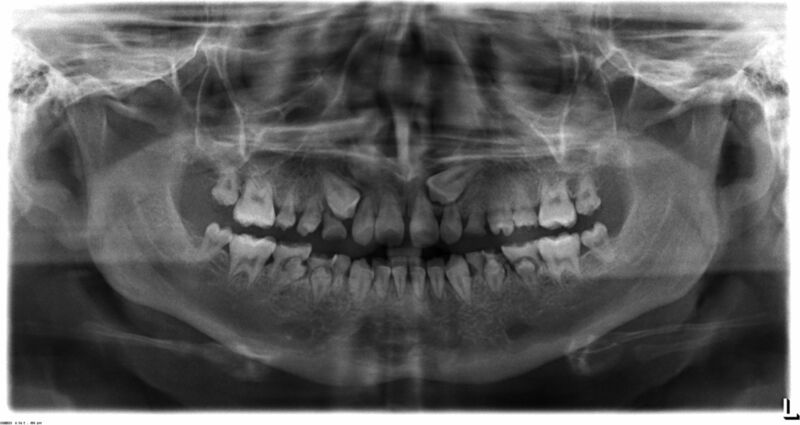 Children who receive cancer therapy develop dental and craniofacial problems that manifest later in life.5 Some specific oral and dental manifestations of childhood cancer treatment include higher risk for dental caries, xerostomia, tooth agenesis, microdontia, enamel hypoplasia, and blunting of roots.34-36 Figure 2 is a panoramic radiograph of a 15-year-old male who was diagnosed with high-risk acute lymphocytic leukemia at 2 years of age. He received chemotherapy, radiation therapy, and HCT. His radiograph shows microdontia of all his permanent teeth with blunting and tapering of roots. He also has agenesis of his permanent third molars. Figure 2. Panoramic radiograph of a 15-year-old male who was diagnosed with high-risk acute lymphoblastic leukemia at 2 years of age. He received chemotherapy, radiation therapy, and hematopoietic cell transplantation. Radiograph shows microdontia of all his permanent teeth, blunting and tapering of roots, and agenesis of permanent third molars. The permanent teeth affected and the severity of dental anomalies depend on the age of the child and stage of dental development at the time of cancer chemotherapy and/or radiation therapy, as well as the intensity of cancer therapy.37,38 A higher incidence of dental anomalies and developmental dental defects should be anticipated in children who receive cancer therapy before the age of 3 years.37 Figure 3 is a panoramic radiograph of an 8-year-old male with Diamond-Blackfan anemia who received chemotherapy and HCT at the age of 3 years. His radiograph shows agenesis of his maxillary second premolars, microdontia involving all 4 second permanent molars and mandibular second premolars, and delayed development of the permanent dentition. Figure 3. 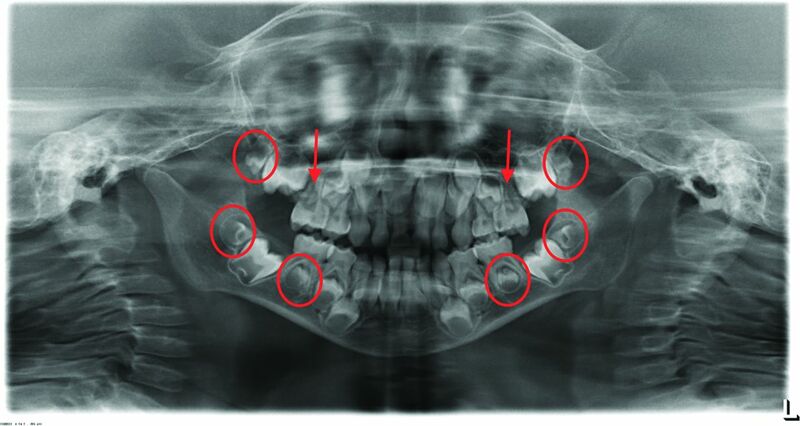 Panoramic radiograph of an 8-year-old male with Diamond-Blackfan anemia who received chemotherapy and hematopoietic cell transplantation at age 3 years shows agenesis of his maxillary second premolars (red arrows), microdontia involving all 4 second permanent molars and mandibular second premolars (red ovals), and delayed development of the permanent dentition. Because of exposure to ionizing radiation, the developing craniofacial complex may exhibit malocclusion with a skeletal etiology.18 The orthodontic problems may be compounded by dental anomalies (tooth agenesis, microdontia). Often in teen years, these patients and their parents may desire orthodontic treatment. However, the caries risk because of xerostomia and enamel hypoplasia may prevent implementation of an ideal orthodontic treatment plan. If the teeth have blunted roots, orthodontic treatment is further limited as orthodontic movement of teeth can further reduce root length and lead to unfavorable crown-root ratios. The use of light orthodontic forces and compromised results should be discussed with the patient and parents.39 Figure 4 shows dental crowding, malocclusion, pulp chamber obliteration, and severe shortening of the roots of all permanent teeth in a 17-year-old who is a 15-year neuroblastoma survivor. Orthodontic treatment plans for childhood cancer survivors should take these limitations into consideration. Figure 4. 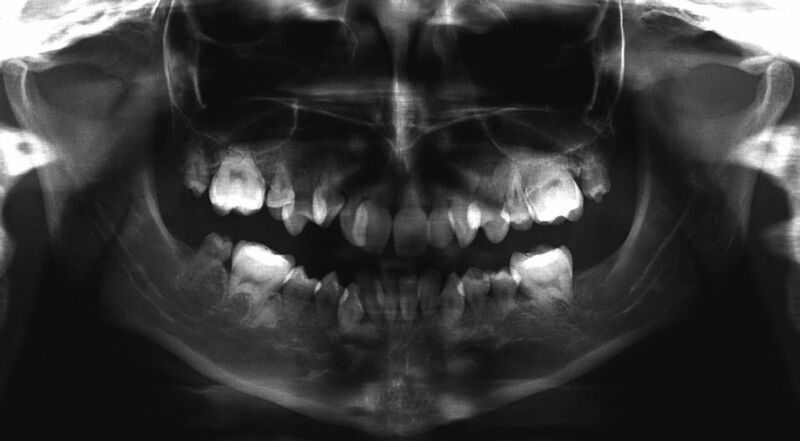 Panoramic radiograph of a 17-year-old shows dental crowding, malocclusion, pulp chamber obliteration, and severe shortening of the roots of all permanent teeth. The patient is a 15-year neuroblastoma survivor. The pediatric dentist should be involved in the management of children with cancer from the time of cancer diagnosis so that an individualized preventive oral care program can be developed for each patient. Acute and long-term oral complications related to cancer treatment can be managed and treated in a patient-centered manner. The pediatric dentist needs the support of the oncology team to provide safe and effective dental treatment. Similarly, the oncology team needs the pediatric dentist to ensure that the child’s oral cavity is disease-free to avoid complications during cancer therapy. Interprofessional collaborative care ensures patient comfort and best outcomes during and after cancer therapy. Cancer facts & figures 2016. American Cancer Society. www.cancer.org/cancer/cancer-in-children/key-statistics.html?_ga=2.269021617.1775200394.1539201841-743091858.1539201841. Published 2018. Accessed October 10, 2018. Childhood cancers. National Cancer Institute. www.cancer.gov/types/childhood-cancers. Published 2018. Accessed October 10, 2018. Guideline on dental management of pediatric patients receiving chemotherapy, hematopoietic cell transplantation, and/or radiation therapy. Pediatr Dent. 2016 Oct;38(6):334-342.
. Leukemic children: clinical and histopathological gingival lesions. J Clin Pediatr Dent. 1998 Spring;22(3):253-256.
. Oral complications and dental care in children with acute lymphoblastic leukaemia. J Oral Pathol Med. 2015 Aug;44(7):483-489. doi: 10.1111/jop.12266. Policy on early childhood caries (ECC): unique challenges and treatment options. Pediatr Dent. 2017 Sept;39(6):62-63.
. Preventive dental care: an educational program to integrate oral care into pediatric oncology. Clin J Oncol Nurs. 2017 Oct 1;21(5):611-616. doi: 10.1188/17.CJON.611-616.
. Caries experience of leukemic children during intensive course of chemotherapy. J Clin Pediatr Dent. 2008 Winter;32(2):155-158.
. Improving oral hygiene skills among children undergoing treatment at the haemato-oncology department - an interventional programme. Int Dent J. 2015 Aug;65(4):211-215. doi: 10.1111/idj.12171.
. The results of a preventive dental program for pediatric patients with hematologic malignancies. Oral Health Prev Dent. 2004;2(1):59-65. Guideline on fluoride therapy. Pediatr Dent. 2016 Oct;38(6):181-184. Guideline on caries-risk assessment and management for infants, children, and adolescents. Pediatr Dent. 2016 Oct;38(6):142-149.
. Trismus in a 6 year old child: a manifestation of leukemia? J Clin Pediatr Dent. 2002 Summer;26(4):337-339.
. The degree and time-course assessment of radiation-induced trismus occurring after radiotherapy for nasopharyngeal cancer. Laryngoscope. 2005 Aug;115(8):1458-1460. doi: 10.1097/01.mlg.0000171019.80351.46. Trismus in patients with head and neck cancer: etiopathogenesis, diagnosis and management. Clin Otolaryngol. 2015 Dec;40(6):516-526. doi: 10.1111/coa.12488.
. Dental management of the pediatric oncology patient. Curr Opin Dent. 1991 Oct;1(5):577-582.
. Children undergoing chemotherapy: is it too late for dental rehabilitation? J Clin Pediatr Dent. 2016;40(6):503-505. doi: 10.17796/1053-4628-40.6.503.
. Considerations in the pediatric population with cancer. Dent Clin North Am. 2008 Jan;52(1):155-181, ix. doi: 10.1016/j.cden.2007.10.001.
. Dental pulp therapy for primary teeth in children undergoing cancer therapy. Pediatr Blood Cancer. 2014 Dec;61(12):2297-2301. doi: 10.1002/pbc.25227.
. Silver diamine fluoride has efficacy in controlling caries progression in primary teeth: a systematic review and meta-analysis. Caries Res. 2017;51(5):527-541. doi: 10.1159/000478668.
. Orthodontic management of patients with hematologic malignancies. Am J Orthod Dentofacial Orthop. 1996 Jun;109(6):575-580.
. Oral concerns for the pediatric cancer patient. J Pedod. 1986 Fall;11(1):35-46.
. Oral manifestations in pediatric patients receiving chemotherapy for acute lymphoblastic leukemia. J Clin Pediatr Dent. 2010 Spring;34(3):275-279.
. Chemotherapy protocols and incidence of oral mucositis. An integrative review. Einstein (Sao Paulo). 2018;16(1):eRW4007. doi: 10.1590/s1679-45082018rw4007.
. Management of oral and gastrointestinal mucositis: ESMO clinical practice guidelines. Ann Oncol. 2011 Sep;22 Suppl 6:vi78-84. doi: 10.1093/annonc/mdr391. The incidence and severity of oral mucositis among allogeneic hematopoietic stem cell transplantation patients: a systematic review. Biol Blood Marrow Transplant. 2016 Apr;22(4):605-616. doi: 10.1016/j.bbmt.2015.09.014.
. The importance of assessment rating scales for chemotherapy-induced oral mucositis. Oncol Nurs Forum. 2006 Nov 27;33(6):1085-90; quiz 1091-1093. doi: 10.1188/06.ONF.1085-1093. World Health Organization handbook for reporting results of cancer treatment. World Health Organization. Geneva, Switzerland; 1979. apps.who.int/iris/bitstream/handle/10665/37200/WHO_OFFSET_48.pdf?sequence=1&isAllowed=y. Accessed October 12, 2018.
. Burden of oral mucositis in stem cell transplant patients-the patients’ perspective. Support Care Cancer. 2018 May;26(5):1577-1584. doi: 10.1007/s00520-017-4000-5.
. The development of evidence-based guidelines on mouth care for children, teenagers and young adults treated for cancer. Eur J Cancer. 2010 May;46(8):1399-1412. doi: 10.1016/j.ejca.2010.01.023.
. Prevalence of oral manifestations in children and adolescents with cancer submitted to chemotherapy. BMC Oral Health. 2017 Jan 20;17(1):49. doi: 10.1186/s12903-016-0331-8.
. Critical review of current clinical practice guidelines for antifungal therapy in paediatric haematology and oncology. Support Care Cancer. 2017 Jan;25(1):221-228. doi: 10.1007/s00520-016-3412-y.
. Effect of commonly prescribed liquid medications on streptococcus mutans biofilm. An in vitro study. J Clin Pediatr Dent. 2017;41(2):141-146. doi: 10.17796/1053-4628-41.2.141.
. Decayed, missing and filled teeth index and dental anomalies in long-term survivors leukaemic children: a prospective controlled study. Med Oral Patol Oral Cir Bucal. 2012 Nov 1;17(6):e977-e980.
. Long-term effects of chemotherapy on caries formation, dental development, and salivary factors in childhood cancer survivors. Oral Surg Oral Med Oral Pathol Oral Radiol Endod. 2007 Dec;104(6):781-789. doi: 10.1016/j.tripleo.2007.02.029.
. Long-term effects of chemotherapy on dental status of children cancer survivors. Pediatr Hematol Oncol. 2013 Apr;30(3):208-215. doi: 10.3109/08880018.2013.763391.
. Oral health and dental late adverse effects in children in remission from malignant disease. A pilot case-control study in Italian children. Eur J Paediatr Dent. 2014 Mar;15(1):45-50.
. Dental abnormalities after chemotherapy in long-term survivors of childhood acute lymphoblastic leukemia 7-40 years after diagnosis. Support Care Cancer. 2016 Apr;24(4):1497-1506. doi: 10.1007/s00520-015-2940-1.
. Orthodontic treatment in long-term survivors after pediatric bone marrow transplantation. Am J Orthod Dentofacial Orthop. 2001 Nov;120(5):459-465. doi: 10.1067/mod.2001.118102.